We did it! Thanks for your support. A new roof was placed on this historic house in early November 2017, just before the rainy season. We also removed additional wood rot in the siding and replaced a window. The historic Trinidad Art Gallery building was built in the year 1900 and known by local historians as the ‘Riecke House’. This property was gifted to the Land Trust in 2011 by Ned Lee Simmons as directed in his will. The building is currently in need of a new roof. This season’s abundance of rain is good for our rivers, but as we see, can cause problems to roads and historical buildings with old roofs. Unfortunately, the rains have strained the limits of the aging roof and leaks have been finding their way into the interior. TCLT is working with a small group of artist community volunteers on a fundraising effort to purchase a new roof for the Trinidad Art Gallery. Our goal is to raise $15,000 by this fall, before next winter’s storms. In support of this effort, the Trinidad Art Gallery is offering a fundraise wine pour each Trinidad Art Night, 6pm-9pm, first Fridays of the month, May 5th through September 1st. Stop by for a glass of wine, information on the fundraising effort, and a gallery tour at 490 Trinity Street. Please consider a tax-deductible donation and join our roof fundraising campaign to protect this historic building. Donations can be made to the Trinidad Coastal Land Trust via check, cash or credit card (from our website or over the phone). Be sure to mention your gift is for ‘the new roof’. Please note that donations can be made ‘in honor of’ or ‘in memory of’ someone special using the donation form on our website. Here at the Trinidad Art Gallery we want to extend a warm invitation to you to visit us during our Featured Artist Openings, taking place every TRINIDAD ART NIGHT, first Fridays of the month from May through October. The dates are May 5, June 2, July 7, August 4, September 1 and October 6, from 6 to 9 p.m. As always, there will be live music, food and new artwork by the featured artist of each month. And, what we're most excited about is our chance to thank Trinidad Coastal Land Trust by pouring wine as a fundraiser for TCLT's repair efforts on this historic building that houses our gallery. It's quite unusual for a cooperative artists gallery to be partnered with a land trust, so let us give you a brief backstory. Ned Simmons, a well-known Trinidad resident, had a small gallery exhibiting local artists in the front room of his home. When he passed away he bequeathed the home to the Trinidad Coastal Land Trust in the hopes it would remain a gallery. The land trust is 'dedicated to protecting for the public benefit the natural beauty and character of Humboldt County from Little River to Big Lagoon', and as a non-profit holds title to nine properties and 11 easements. As busy as that keeps the Trinidad Coastal Land Trust, they were not in the position to operate a gallery! That's where our partnership came in. 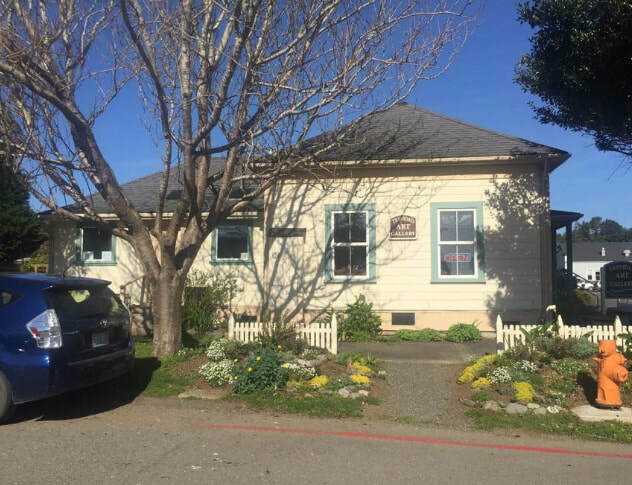 TCLT accepted a proposal from our group of local artists to rent this historic building, and as an artists cooperative, operate a gallery to exhibit our arthere in town. The rest, as you know, has been up to your visits and support as this cooperative gallery successfully enters it's 5th year. As artists who greatly appreciate the Trinidad Coastal Land Trust's stewardship of this beautiful coastline, the wine table at our TRINIDAD ART NIGHT openings will have information on the land trust, the property it maintains and protects, and the chance to lift a glass of wine to salute to our unique art/land trust partnership. Do stop by and join us in this fundraising celebration! For additional information about TCLT and their efforts to maintain and preserve this historic building that houses our artist's cooperative, we share (below) the letter they recently submitted to our local community. We at Trinidad Art Gallery sincerely thank you, our visitors, for your continued friendship as we all enjoy the unique qualities our small coastal village and surrounding coast line offers. Have a wonderful summer, we do look forward to seeing you! I hope you are well and staying dry as this wet winter progresses into an equally rainy spring. This abundance of rain is good for our rivers, but as we see, can cause problems to roads and historical buildings with old roofs. The historic Trinidad Art Gallery building.gifted to the Land Trust in 2011 by Ned Lee Simmons as directed in his will is in need of a new roof. Unfortunately, the rains have strained the limits of the aging roof and leaks have been finding their way into the interior. I am working with a small group of artist community members on a fundraising effort to purchase a new roof for the Trinidad Art Gallery. Our goal is to raise $15,000 by this fall, before next winter's storms. 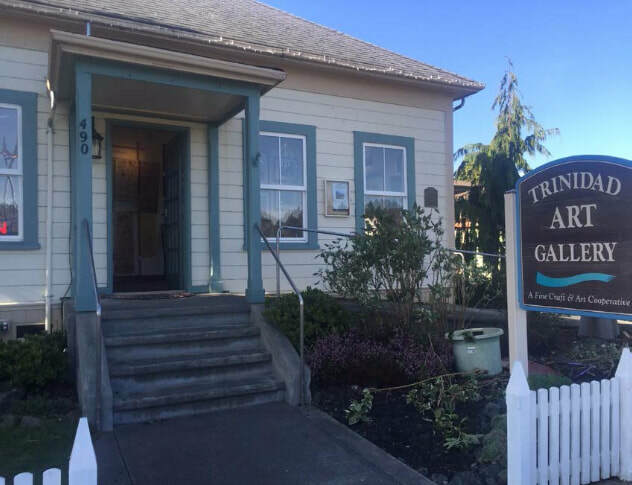 In support of this effort, the Trinidad Art Gallery is offering a fundraising wine pour each Trinidad Arts Night, 6pm-9pm, first Fridays of the month, May 5th through September 15. I hope you will stop by for a glass of wine, information on the fundraising effort, and a gallery tour at 490 Trinity Street. Please consider a tax-deductible donation to the Land Trust and join our efforts to protect and restore the old gallery roof at Ned's house, new home to a model business cooperatively owned by 25 artist-members. Donations can be made to the Trinidad Coastal Land Trust via check, cash or credit card (from our website or over the phone). Be sure to mention your gift is for the new roof. Donations can be made in honor of or in memory of someone special using the donation form on our website. Thank you for supporting Ned's vision to preserve the Trinidad Art Gallery for local artists. Your Land Trust donation will go towards a new roof and also makes a positive and multiplying effect on protecting Trinidad’s amazing natural resources for generations to come. Please call me anytime to discuss further.